Malcolm Thompson Pumps' Stalker ISO Chrome iron pumps. The team at Malcolm Thompson Pumps (MTP) know a thing or two about mining. They have been servicing the mining industry for over 50 years, with a solid history of supplying centrifugal end suction pumps and pumping systems. Seeing the punishing conditions of a mine site and its effect on standard pump materials, MTP developed its ISO Chrome Iron Series. 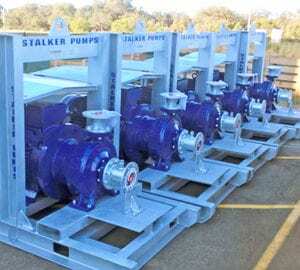 The ISO Chrome Iron Series of pumps are manufactured in Perth by Stalker Pumps, a division of Malcolm Thompson Pumps, with an onsite foundry and manufacturing facility. The Stalker Pumps brand has been in operation since 1923 and has long been recognised for performance, reliability and durability. The ISO Chrome Iron Series are designed for longevity and high wear resistance, particularly in underground coal mines, hard rock mines and open cut applications. The pumps are manufactured from 27 per cent chrome iron, providing greater durability and a high wear resistance for pumping abrasive, fibrous and corrosive liquids, making it perfect across all applications on a mine site. While the ISO Chrome Iron Series has a larger capital expenditure as opposed to standard construction models, they provide excellent value for money, with the ability to seriously outlast their cheaper counterparts. While other units can quickly wear out, especially due to corrosion of the volute or back plate, the Chrome Iron can survive years of abuse. 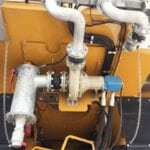 However, according to Phillip Brogan from MTP, it is essential to stick to a preventative maintenance program, even when the pump seems to be performing perfectly. Malcolm Thompson Pumps has been supplying chrome iron pumps to mining customers across Australia for over 20 years. Besides the advantages associated with using a high percentage of chrome iron, customers also benefit from the location of the Stalker foundry and manufacturing facility. Having the end-to-end manufacturing of this product happening in Perth equates to fast lead times for both the pumps themselves and for future spare parts. It also means that MTP service technicians are Stalker Pump experts and can quickly and effectively service and repair pumps onsite. The Stalker ISO Chrome Pumps are available now and can be ordered directly from Malcolm Thompson Pumps.